At the Vallès Occidental you will find unique products, of quality and proximity, linked to the territory. For more information, see the catalogue Tasta el Vallès where you will find both these products and the names of the people behind them. We invite you to fill the basket with the excellent products of our territory! Al Vallès, veremem! (In the Vallès we harvest grapes) is a project of the Consorci de Turisme del Vallès Occidental to spread and gather the different experiences of recovery of the vineyard and wine production that we have in the region. With the brand “Vins del Vallès Occidental” you will recognize the wines of the region. Do you know what life was like in a Benedictine monastery? Do you want to be future Paleontologists? Would you like to know more about a baker? The Vallès Occidental offers a wide range of educational projects to discover and experience what books tell us. This manual includes several resources for learning, teaching and research that can be found in our immediate environment. High level sports facilities, clubs participating in competitions of major professional sports reputation, good communication networks, proximity to Barcelona… There are a lot of reasons to organize a sports stay in the Vallès. You will find all that the region offers in this manual. Are you ready to live and discover the Vallès? On every page you will find all kind of different proposals: whether you want to take a good walk, or if wishing to explore the local cuisine or follow the story hidden in the smallest towns of the region. Start reading the proposal that you like more and… Good adventure! The Vallès, an engine of the economy area, space of knowledge and example of modernization and innovation, offers the best facilities for meetings, conferences, exhibitions and incentives. In this book you will find unique and quality proposals and a wide range of services and complementary activities after meeting. 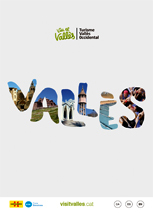 This guide provides a tour for the Vallès Occidental to know the more relevant resources and tourist attractions of the region. You can check this publication in Catalan, Spanish, English and French. How to make your company a place to be visited. FAQ’s (Xarxa de Productes de la Terra). WE MAKE OLIVE OIL AND WE HAVE SURPLUS. IS IT POSSIBLE TO COMMERCIALISE IT? WE HAVE MADE TINNED FOOD. WHAT DO WE HAVE TO DO TO SELL IT? FROM THE VEGETABLE GARDEN TO THE RESTAURANT TABLE. HOW TO DO IT? LET US MAKE TINNED FOOD FROM THE SURPLUS OF FRUITS AND VEGETABLES. REQUIREMENTS OF A WORKSHOP. WHAT SHOULD I DO TO LEGALISE HARVEST AND DIRECT SALES OF HONEY?